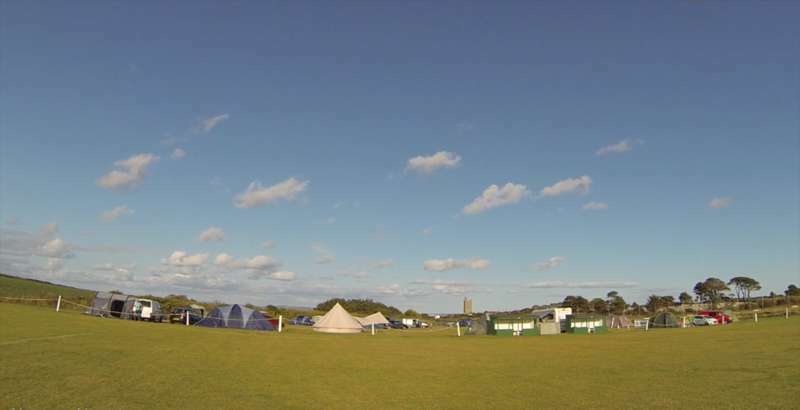 Suitable for tents only – campervans, motorhomes or caravans should book the Campervan/Motorhome pitch if available. Non-electric hardstanding, accommodates up to 6 people (max 2 cars). 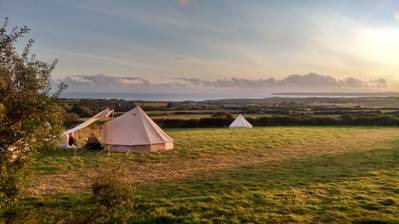 Our 4m pre-erected bell tent sleeps four people with beds and solar lighting provided. You have your own private picnic/garden table and chairs. A short downhill walk from Paul will take you straight into the beautiful village of Mousehole. Facilities on site include newly tiled solar-powered showers, and wash basins supplied with hot water, a clubhouse (open during busy times) selling soft and alcoholic drinks, a pool table, table football, television and ample car parking. We’ve heard of campsites with a footballpitch on offer, but how about the other way round? 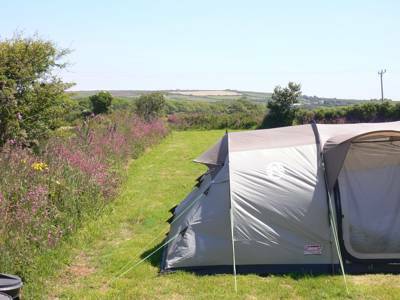 Tucked in the far southwestern corner of the British Isles, Mousehole Camping in Cornwall offersexactly that – a minor league football club that have introduced a handy littlecampsite adjacent to their playing field. Trungle Parc is home to the South West Peninsula League's finest, Mousehole AFC. Their idea, is nothing short of genius. 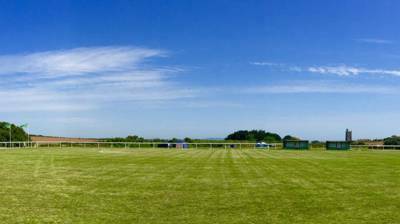 The essential facilities have long been in place – showers, toilets andsinks inside the main changing rooms and a clubhouse bar, with cheap drinks anda fantastic community atmosphere – while the field is purposefully flat andwell drained, the ideal conditions for camping. If you don’t mind that slightlymakeshift, pop-up campsite feel than you can’t go far wrong here. 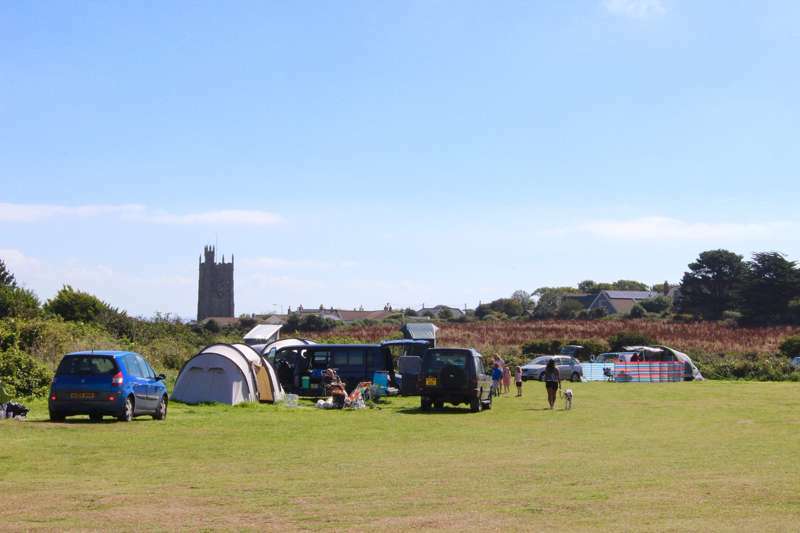 Tents are welcome in July and August (when the footy season is over) but if you've come by campervan and secured one of the five prized, pitches, there’s afree game to watch every Saturday! Of course, the real success of thiscampsite doesn’t stem from the fact that the facilities are well maintained andprices kept conveniently low (though it certainly helps), but more importantlyfrom its knock-your-socks-off location. At the end of the day, this is the realreason a football club can get away with opening up a corner of its ground andotherwise just leaving you to it! A stroll away from the campsite entrance,the tiny village of Paul has all the endearing characteristics you’d expect ofvillage with the same name as your mate from down the road. Paul’s local, theKings Arms, is a cosy, old stone haunt, with a couple of picnic benches outside, looking across to the parish church opposite. The centre of thevillage’s history, this towered old building is said to have been founded inthe year 409 by the Welsh saint, Paul Aurelian... though a further two SaintPaul’s are also disputably it’s rightful honouree. Today’s structure actuallydates to the year 1600, after the invitingly isolated Penwith Peninsula wassacked and burned by marauding Spaniards five years earlier. The campsite or, more accurately, thefootball club, takes its name from the next village over, a tiny cluster ofhouses encircling a beautiful old harbour. It was here that the Spanish firstlanded, with a plaque outside the only surviving building that reads "SquireJenkyn Keigwin was killed here 23 July 1595 defending this house against theSpaniards". Today the picture-perfect spot, speckled with colourfuldinghies, boasts a sandy crescent beach when the tide is out and excellentcrabbing opportunities from the far harbour walls. It’s your first discovery ofmany along this stretch of heritage coastline; a peninsula on the very edge ofthe country with all the drama, history and intrigue that you could ask for. 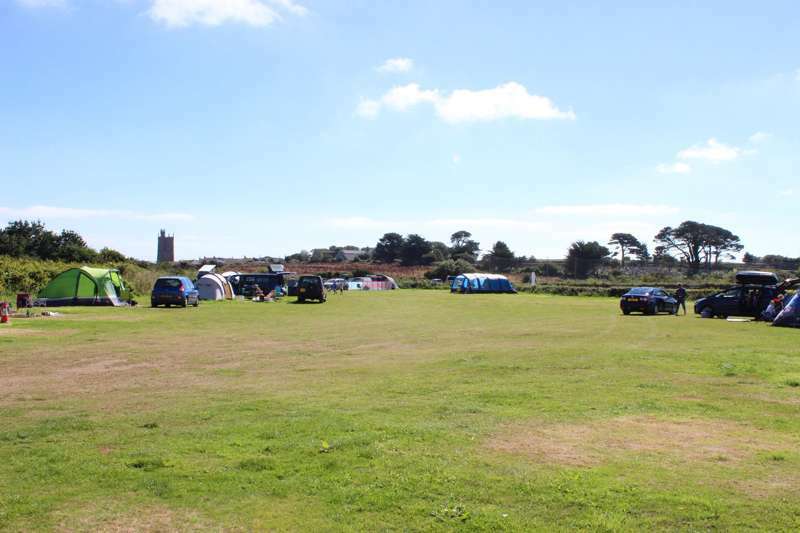 For latest availability and best prices for Mousehole Camping, please use the Date Search above. We really enjoyed camping here, the facilities were all in the club house and very good. They now have pre marked camping pitches that are a good size. We really liked the location with Mousehall being a 20 minute walk away and a very good pub a 5 minute walk away. Quiet, basic facilities but suitable for what you need. Good pub within walking distance. Walking distance from Mousehole although uphill back to site! Spaces are not defined, we arrived back from the pub one evening to find ourselves surrounded by a large group in numerous tents large and small and the ‘communal’ eating area virtually at our back door! No respect for other campers ‘personal space’ which may have been avoided by clearly defined plots. Our stay at Mousehole AFC was not with incident - despite it being the middle of summer the front of our tent was blown in, and the field just about held off becoming a paddy field at some points. We stayed for two weeks, and were very well looked after by the site manager Les. One problem was the lack of defined pitches in the busy period; it meant we had to move at one point just to have a decent amount of privacy. Loved the showers - very nice after a day's activity, and the location is great - easily reach stunning clifftop walks, beaches and coves. We were welcomed to the site by Les who turned up within a few minutes of contacting him and showed us where to pitch our tent, he gave us a quick run down of the local area and gave us some money off vouchers for local attractions. The shower facilities are within the football changing rooms and could cope fine with the amount of people staying on the site. The field was full with other campers and there was room to park the car next to our tent. There is a bar which is open in the evening with a pool table and table football, we made use of this as it was very damp during our stay. There was also a game on for one of the evenings which meant there was a great atmosphere in the bar as they have a good following. The campsite is in a great location with a nice walk down to Mousehole although we couldn't face the walk back up the hill so got the bus. It is just a short drive to Penzance, just a few minutes where there are a number of supermarkets. 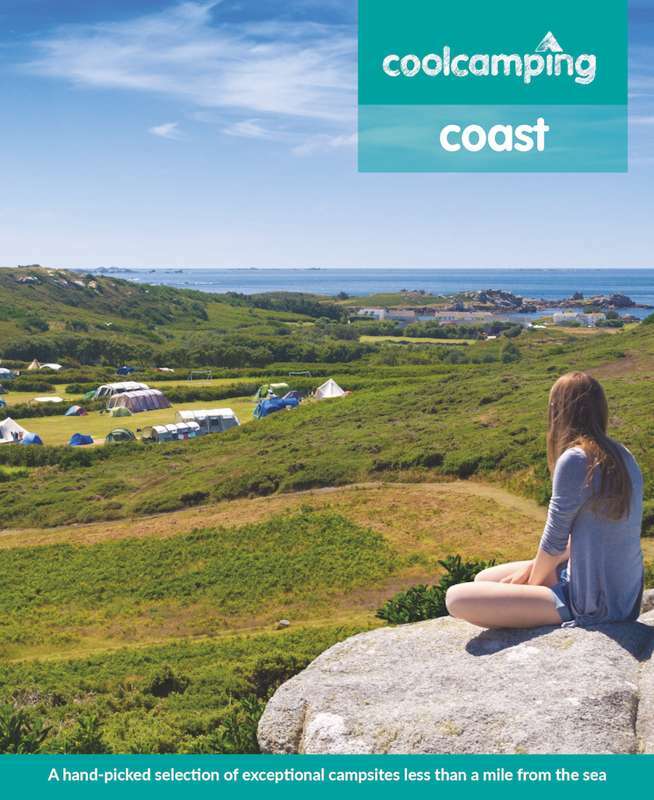 If you are looking for a decent, back to basics campsite on a small scale this place is perfect chilled out Cornwall- 'andsome! Approx. 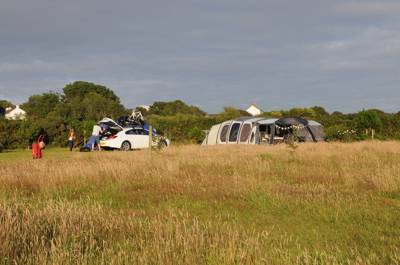 25 camping pitches and 5 harder spots for campervans or motorhomes. 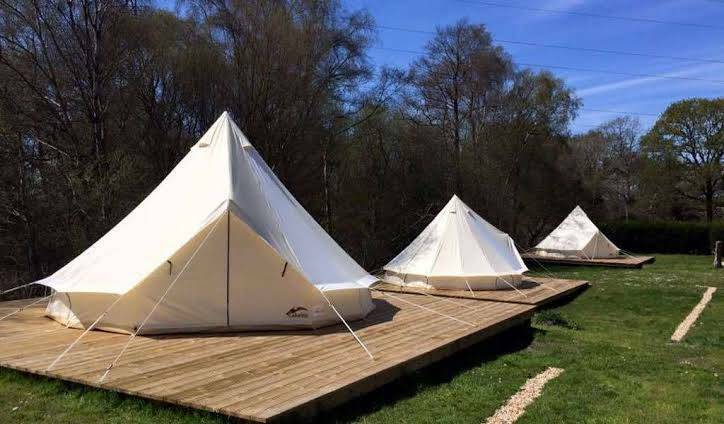 9 pre-erected Bell tents that can sleep 4 people in each. 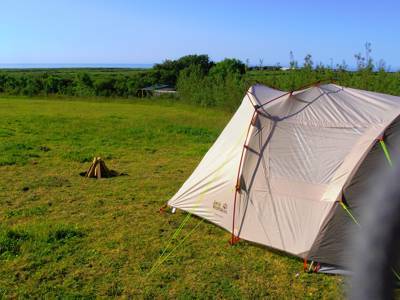 Tents, campervans, motorhomes familes, groups, dogs – yes. All campers will receive an information pack from the site manager on arrival. Facilities on site include newly tiled solar-powered showers, and wash basins supplied with hot water – all of which are in the football club changing rooms. The clubhouse (open during busy times) sells soft and alcoholic drinks and has a pool table, table football, television and ample car parking. There is a large stainless steel sink for washing up your pots and pans. The referees changing room also has a freezer that can be used for ice-packs. Campfires not permitted and BBQs must be raised off the ground. Walk the 15 minutes to picture perfect Mousehole, an attractive fishing village centred around its beautiful old harbour. Wander the cobbled streets visiting the art galleries and independent shops or catch a bus from there to Penzance, the most well known spot on the Penwith Peninsula and just 3 miles from the campsite. St Michael's Mount (01736 710265) is then just a 20-minute walk along the seafront and across the beach – you can walk the causeway at low tide or take the boat when it's high. Elsewhere, you can't come this far and not go all the way out to Land's End, the UK's most south westerly point. Just a couple of miles to its east Porthcurno beach is extremely popular, though its surprising treat is actually the overlooking Telegraph Museum (01736 810966), marking what was once the world’s biggest submarine telegraph station. Step inside to find family quiz trails, secret WWII tunnels and interactive exhibits. The adjacent Minack Theatre (01736 810181) is also a must-see. Bring a blanket and picnic and watch a play at the ocean’s edge. At busy times the MFC clubhouse opens, serving well-priced drinks. Just 500 metres away, the tiny village of Paul has a great local, The Kings Arms (01736 731224), serving hearty pub meals and a wide range of beers. Wi-Fi is available at small extra charge. It's around a 15-minute downhill walk to the village of Mousehole with it's amazing harbour and more options when it comes to pubs and restaurants. The main town of Penzance is less than 10 minutes drive away with more wide-spread amenities, such as major supermarkets (Tesco, Sainsburys and Morrisons), fast food outlets and a great range of take aways and restaurants. July & August (when the footy season is over) for tent camping. 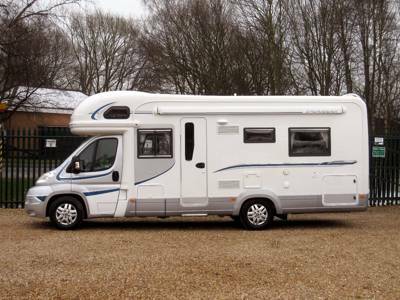 Campervans/motorhomes all year round. From Penzance, head towards Newlyn. At the crossroads go straight across and up the hill. Continue to the top of the hill for approximately one mile until you reach a T-junction (signposted Mousehole and Paul). Turn left and in half a mile before Paul church, turn right. The entrance is at the end of the road, next to Paul Cricket Club.